Shaman ("phaa phi mon") and healing cloths ("phaa sabai") are shawls that are worn and used by a shaman during any of a variety of healing rituals - from curing a physical injury, disease, or a mental illness to protecting a newly born baby or performing a fertility ceremony. The shaman, which can be of either gender, follow a complex tradition that includes elements of Buddhism, ancestor worship, and animism. Healing rituals are essentially performed to chase out bad spirits and return the ill person's own spirit back into their body. Discussed below are the shaman and healing clothes specific to the Tai Daeng people, a larger ethnic group in Houaphon Province in northeast Laos. Many other ethnic groups in Laos and northern Vietnam have similar designs and ritual. The "phaa phii mon" shaman cloths are used exclusively by Tai Daeng shaman for ritualistic healing. These hand-spun, naturally-dyed silk shawls have colorful, tight geometric designs, and it is difficult to pick out an obvious pattern without study. However, buried in the mirror-image patterns are figures designed to help connect with the ancestor spirits – the source of shamanistic power. These figures include: spirit boats, which transport the shaman's spirit to the world of the ancestors; mythical creatures, such as two-headed crested river dragons, elephant-birds, pregnant serpents, and spirit birds; and plant patterns, including flower, seed, hook, and fern designs. See motifs for more information. They range from 16-20 in. wide (40-50 cm) and are 40-60 in. long (110-160 cm). Some "double-wide" shaman cloths (32-36 in. wide (80-90 cm)) may be bordered with plain cotton and used as a ceremonial wedding blanket. Either size makes a stunning shawl! The "phaa sabai" healing cloths are used by both shaman and ordinary people, and use a combination of color and design for their powerful healing protection. The complex geometric patterns hide the mythical figures from the evil spirits which are causing harm. Through dance and chant, the shaman calls upon the spirits of the ancestors to release the power of these hidden figures which then chase the bad spirits from the infected body or place. 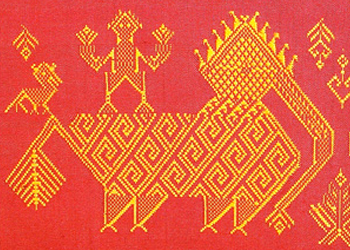 "The symbolism of the textile was a pathway, with the powerful box of river dragons, spirit birds, and crested river dragons to chase out evil spirits and send them to the other end of the textile, which had decorative bands representing a ladder. It was also a pathway for the souls of sick persons to return to their body, and for the helpers of the shaman to come from the spirit world." 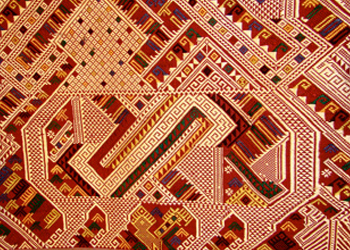 The "phaa phi mon" shaman's cloths are woven in discontinuous supplementary weft design: in one row of weft (the left to right threads), in addition to the primary weft thread, additional threads are added to create the pattern in which the thread changes each time the color changes. If, in one weft row, the color changes 20 times, the artist manually weaves 20 spools of thread through a hand-picked pattern to create the specific design. Generally, there over 40 rows of weft per inch, and there is no plain, central, solid-colored section. This detailed, time-consuming weaving process takes up to four months; this is time spent in addition to raising the silkworms, spinning the thread, gathering the natural dyes, making the dyes, and dying the threads. Designs and colors used vary by village and region based upon traditions and the weaver's artistic sense. Sukavit modeling her man-woman healing cloth in Houaphon Province, Laos. Weaver in Houaphon Province, Laos, showing her shaman cloth with Siho and Naga patterns. Weaver in Houaphon Province, Laos, with her shaman cloth with lantern patterns. Another type of healing cloth is the "man-woman healing cloth," with each end of the shawl containing an identical diamond-shaped design, but with unique coloration. The "man" side is of one color with a small multi-colored lozenge in the middle; the "woman" side is brightly multi-colored (rumor has it that woman are more complex than men, and hence the brilliance). "Man-Woman" healing cloths are particularly stunning! The Tai Daeng weavers in NE Laos, as they have for generations, still insist on raising their own silk and creating their own 100%-natural dyes. Healing cloths are used in healing ceremonies, and are also used in ceremony to foster a healthy future for the village or crops. They may be worn by the healer, or the ill person, or even laid in the garden depending on the unique traditions of that village and the type of healing that is being sought. Each ethnic group, sub-group, valley, and even individual villages often have unique styles of weaving and ritual to express their spiritual lives and needs; even individual weavers have input as to a healing cloths' design elements and color. Shaman also wear and use many other special ceremonial items: hats, belts, knives, tassels, staves, masks, and musical instruments such as bells and cymbals. Please see our gallery section on Spiritual Art for examples of these ritual items. The interest of Phaa Phii Mon and Phaa Sabai in the small but developing broader market has allowed the artistic talent and voice of these extraordinary Tai Daeng weavers to supersede the narrower needs of the traditional village shaman and healer. For example, instead of the traditional red background color, a weaver may now choose warp, weft, and supplemental colors that play to her creative eye and spirit. Artists are freer to make subtle modifications to design elements or variations to dyes, or they may "borrow" a motif from a neighboring tradition. Indeed, a ceremonial blanket, minus its traditional plain hemp border, now finds a new market as a stunning opera shawl. The Tai Daeng weavers in NE Laos, as they have for generations, still insist on raising their own silk and creating their own 100%-natural dyes. They still weave on wood-frame, hand-built looms, and their artistic expression is still closely married to their traditional motifs and spiritual values. Most still live in traditional small villages and adhere to their animist and Buddhist traditions. But the broader market for these textiles has empowered the Tai Daeng to more highly value the time spent raising, weaving, and dying silk. The textile arts now can help support a village financially, as well as maintain the traditional arts and beliefs. In addition, because women are usually the textile creators, this market acts to empower women both within their own village and in the larger business world. We have visited many cultural groups and villages throughout SE Asia who had rich textile traditions until two or three generations ago. Synthetic materials, chemical dyes, and access to factory-made western clothing have proven too great a convenience for all but those cultures, like the Tai Daeng, with strong traditions tied to their textiles and the savvy to reach a market that can support the immense investment of time and talent. Some older cloths that have seen authentic ritual use can be found, more often in an urban shop catering to collectors. They are rarely in good condition and may command a high price. Above the Fray does not seek antiques and culturally significant rarities; Lao and Vietnamese customs strictly and appropriately prohibit the export of such items. We occasionally are privilege to gain older pieces allowed for export as would be noted in the item's description. The "Museum-Quality" and "Ceremonial Objects" galleries may also include older textiles. Ancestor spirit on the back of a Siho (elephant-lion) with hong bird and flower designs. Siho (elephant-bird) pregnant with a Naga (mythical river serpent – look for the triangular head and s-shaped body). Needless to say, the friendships and warmth that these talented people have offered our family has been our deepest enrichment. We are grateful for their hospitality and trust. Our blog introduces some of these talented artists and their villages as well as shares stories of our relationships with them. Our on-going, personal relationship with artists has allowed Above the Fray to uniquely represent some of the world's finest-quality silk textiles. You will find these pieces on our gallery pages on this site and at our "Fine Silks and Tribal Art" Events.